A once-unthinkable crisis in the world’s greatest freshwater region — one that sent more than 500,000 metro Toledo residents scrambling for bottled water Saturday — enters its second day today, with officials inside the city’s Collins Park Water Treatment Plant wondering how much longer it will take before clean, safe, and reliable tap water will flow again from faucets of area homes and businesses. “We’ve been getting mixed results,” Jeff Martin, a senior chemist at the plant, confessed during an exclusive interview with The Blade on Saturday while performing tests for microcystin — a toxin produced by the harmful blue-green algae known as microcystis — inside the plant’s laboratory on samples drawn from 39 metro Toledo sites. The cause of the microcystis algae bloom is primarily phosphorus from farm fertilizer runoff, and the amount of phosphorus determines the bloom’s size. Scientists are also learning that another farm fertilizer, nitrogen, affects the size and composition of the annual bloom. Toledo sits on the shoreline of the Great Lakes, which holds 20 percent of the world’s fresh surface water. A small water treatment plant in Ottawa County’s Carroll Township was Ohio’s first to be overwhelmed by the toxin last September. 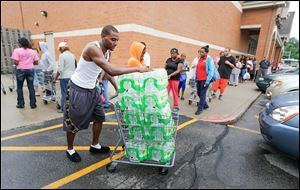 Until 2 a.m. Saturday, city and state environmental officials maintained such a crisis was unlikely in Toledo because the water plant is western Lake Erie’s largest and most sophisticated. But after seeing symptoms of a problem emerge late Friday — a series of suspicious test results that showed a pattern of contamination — officials were told by the Ohio Environmental Protection Agency to issue the city’s first “do not drink” or boil warning to the system’s customers. The warning went out on Facebook, followed by a series of news conferences. Toledo Mayor D. Michael Collins said he was notified about 10 p.m. Friday that the numbers weren’t good — even though the algae season has barely begun. About midnight, he heard of the Ohio EPA’s plans to issue a warning against drinking the water.